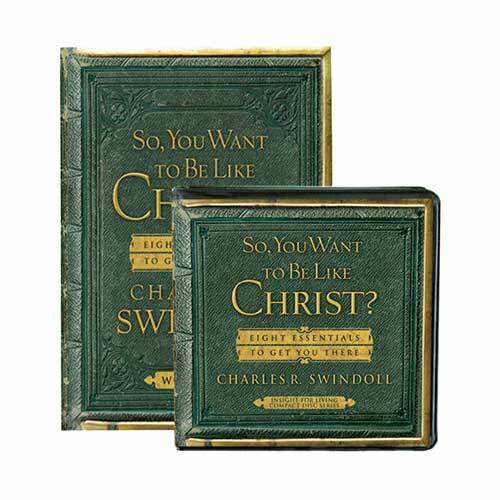 In this user-friendly series, Chuck Swindoll will help flex your spiritual muscles in your Christian faith—prayer, humility, self-control, sacrifice, submission, solitude, silence, and hope. In the process of exercising these disciplines in your life, your relationship will grow stronger with Him, and you’ll discover how you can become more like Christ. Copyright © 1996, 2004, ℗ 2007 by Charles R. Swindoll, Inc. All rights are reserved worldwide. “I Will Follow” by John and Annie Barbour, Performed by Steve Amerson Copyright ©℗ 1991 by Marantha! Music (Admin. The Copyright Company, ASCAP) All rights are reserved worldwide. Used by permission. “To Live Is Christ” by Steve Fry, Arranged by Bill Cantos, Performed by Steve Amerson Copyright ©℗ 1986 by Birdwing Music (Admin. by EMI Christian Music, ASCAP) All rights are reserved worldwide. Used by permission. “This Is My Holy Place” words and music by Don Moen, Performed by Steve Amerson Copyright ©℗ 1989 by Integrity’s Hosanna! Music (ASCAP) All rights are reserved worldwide. Used by permission. “Your Will, Not Mine” words and music by Ron and Carol Harris Performed by Steve Amerson, Copyright ©℗ 1988 by Ron Harris Music (ASCAP) All rights are reserved worldwide. Used by permission. “The Lord’s Prayer” by Albert Hay Malotte, Arrangement by Steve Wilkinson Performed by Steve Amerson, Copyright ©℗ 2005 by Steve Amerson Music (BMI) All rights are reserved worldwide. Used by permission. “It’s Still the Cross” words and music by Niles Borop, Mike Harland, Luke Garrett and Buddy Mullins, Performed by Steve Amerson Copyright ©℗ 1995 by Niles Borop Music (BMI), Centergy Music (BMI), and Centergetic Music (ASCAP). (Admin. by ICG) All rights are reserved worldwide. Used by permission. “Eternal Life” composed by Olive Dungan, Performed by Steve Amerson Copyright © 1949 by The John Church Company (ASCAP) All rights are reserved worldwide. Used by permission. “This Must Be The Place” composed by Steve Amerson and Gary Schmidt Performed by Steve Amerson, Copyright ©℗ 1998 by Steve Amerson Music and Centergy Music (Admin. by ICG) All rights are reserved worldwide. Used by permission.